How big investments in the ‘biofuel of the future’ will grow our future food and its own bio-packaging from algae. by Robert Henrikson • October 27, 2009 Download this 4 page article pdf. Today, algae is called the ‘biofuel of the future.’ 30 years ago, it was called the ‘food of the future’. Three decades ago, the first algae entrepreneurs were building growing ponds in countries like Mexico, India, Israel, Japan, Taiwan, Thailand and the USA. The first algae food supplements were introduced in the US natural food market in 1979. Growing food with 20 times the productivity as conventional crops, algae promised to become the ‘food of the future’. The dominant technology for commercial algae production for food and supplements has been open ponds in warm, sunny climates. Over time, some specialty algae products have been cultivated in closed or fermentation systems. But production costs have remained high due to these factors: using agricultural land, fresh water, clean nutrients, skilled personnel, servicing big investments for pond systems, harvesting and drying infrastructure, and complying with food and quality regulations. With production costs over $10 per kilo, growing algae is ten times the cost of many commercial foods and feeds. Annual world microalgae output may have reached 10,000 tons of spirulina, chlorella, dunaliella and hematoccocus. 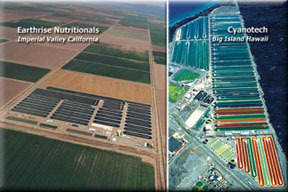 Even big commercial algae farms are relatively small, less than 100 hectares in size. Nevertheless, over the years, the number and variety of high value food and specialty products from algae has flourished. Most people have no idea how many everyday products contain algae. Algae is an ingredient in thousands of products for food, feed, colors, nutraceuticals, medicinals, cosmetics and personal care, biofertilizers and fine chemicals. Even more innovative algae based products are coming. The drive for cheap biofuel will make algae the food of the future. To become the “food of the future”, and compete with conventional human foods and animal feeds, algae production costs must be ten times lower. Lower costs will deliver healthy algae omega 3 oils and protein food and feed products, rebalancing our diets. We’ll see algae based resins, biopolymers, bioplastics and a range of specialty chemicals replacing today’s fossil fuel chemical products. The big algae energy investment underway may take a decade to reach commercial biofuels. Algae food and bio-plastic products are likely to arrive earlier, since fuel is one of the least valuable end products. To deliver competitive algae biofuel, companies will need to crush costs to $1/kg or less! How will algae production costs come down? Biomimicry. Numerous ventures have now successfully raised a combined billion dollars for algae biofuel R&D and production. Innovations and technological breakthroughs will dramatically change the way algae has been produced over the past 30 years. How? •Discover better performing algae cultures. Thirty years ago, scientists used available natural strains such as spirulina and chlorella. Today, backed by R&D budgets, scientists screen, identify and engineer strains of algae with superior and enhanced properties, faster growth rates, and abilities to grow in conditions such as low light and temperature and high saline, brackish or ocean water. •Develop simpler, less costly design and technology. Rethink, redesign and reengineer the entire growing system, harvesting, processing and drying sequence to reduce capital costs for equipment, operating costs and power consumption. •Use marginal land and water just like nature. To grow algae on the large scale needed to produce biofuels, growers should not use valuable fertile agricultural land and scarce fresh water. Rather, find remnant flat land and ocean, saline, brackish or waste water near nutrient resources. •Use waste nutrients just like nature. To lower costs, future algae growing systems will have to follow principals of biomimicry. Recycle waste CO2 effluent, animal and plant wastes, which are costly problems today. Ferment agricultural, animal, industrial and waste streams into carbon, nitrogen, phosphorus, potassium and trace nutrients to feed the algae. Or grow algae by cleaning up municipal waste. •Use all the algae biomass just like nature. Sell all of the algae. Start with the end product and work backwards. What are the products that can be sold, and for how much, and how will markets be developed for those products? •Create multiple revenue streams to offset costs. Environmental services may include CO2 and pollution mitigation, wastewater treatment, biomass and waste heat for generating electricity and even carbon offsets. Non-fuel algae products may represent the 70% of the algae biomass. Potential revenue streams include algae oil and lipid supplementation in animal and human feed, like healthy omega 3 oils, animal feedstocks and supplements, biofertilizers, fine chemicals and bio-plastics, extracts for pigments nutraceuticals, pharmaceuticals and medicinals..
•Get big. Scale up to thousands of hectares. Large algae farms will enjoy economies of scale. Along the way, demonstration farms to prove out technologies will generate revenue streams 50 free spins starburst no deposit 2018, from non-fuel products for smaller markets. •Exploit the unexpected – carpe diem. Investment drives innovation, creates serendipity and breakthroughs. Who knows what will unfold that we haven’t thought of yet. So get use to life from the base of the food chain. The dazzling array of eco-products coming from algae will be healthy for you and our planet.